Here is a small open box made out of little cubes. It is 5 cubes wide, 5 cubes long and 3 cubes high. It is just 1 cube thick everywhere. 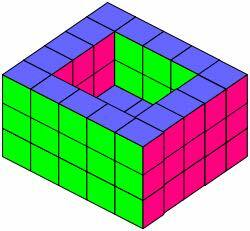 Work out how many little cubes were used to make the open box in the picture. If you were going to make a bigger box that is 5 cubes wide, 12 cubes long, 3 cubes high and just 1 cube thick, how many little cubes would you need? You have 112 little cubes. Imagine that you are asked to make more open boxes which are 1 cube thick, always with a width between 3 and 5 cubes inclusive, the length between 10 and 20 cubes inclusive and the height of 2 or 3 cubes. What size open boxes could you make if you have to use all 112 cubes? If open boxes have to be 1 cube thick, have a width of 3, 4 or 5 cubes inclusive, the length between 10 and 20 cubes inclusive and the height of 2 or 3 cubes (as in the previous challenge), what sizes use exactly 144, 145, 147 and 148 little cubes? Practical Activity. Visualising. Tangram. Working systematically. Cubes & cuboids. Addition & subtraction. Compound transformations. Combinations. Investigations. Interactivities.